Acclaimed instrument and amplifier brand Fender has been at the forefront of the musical universe for over six decades, but it’s taken until very recently for the company to wade into the heavily contested effects-pedal market. 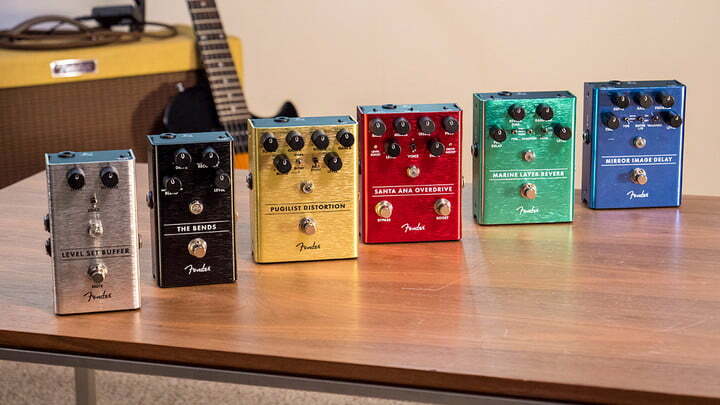 Unsurprisingly to those who have long known and loved the brand for its clean designs, iconic tones, and high-value quotient, Fender’s new six-pedal lineup brings a kaleidoscope of tonal possibilities to guitar players’ fingertips, all at a very palatable price point. The new pedals come in a variety of fun flavors, including reverb, delay, overdrive, distortion, compression, and level buffer models. The circuit designs for the new lineup were led by Fender VP of Product Development Stan Cote, who has spent the past 12 years engineering the company’s amp tones. Cotey and the Fender design team’s success in the new pedal line is clear as soon as you plug in a cable and strum; none of the new offerings re-invent the tonal wheel, but they do offer a vast array of adjustable sounds and very musician-friendly functionality, making them absolutely worth considering for both new musicians and hardened pedal enthusiasts alike. Each of the six pedals come in beautiful, brushed-metal finishes with their respective names embossed in thick ink at the center. Adjustments are handled via smooth-scrolling knobs with LEDs that indicate where a given parameter has been set — very useful for dark stages — while big LED in the middle of each pedal lets you know when it’s active. For anyone who’s spent time with Fender’s excellent amplifiers, the most familiar of the pedals will be the Marine Layer Reverb, which allows you to simulate everything from the company’s acclaimed spring reverb tanks to the massive hall reverb you’d expect to hear in a grand cathedral. Pair that with the atmospheric delay effects of the Mirror Image Delay pedal — which offers digital, analog, and tape delay options — and you can craft compelling backdrops for almost any composition. In fact, the delay pedal came in quite handy when tracking guitars on a recent session we did for a rock EP. If you’re looking for something a bit more rocking and less psychedelic, we were also very impressed with the Pugilist Distortion and Santa Ana Overdrive pedals. The former brings thick and hairy chords that recall your favorite Metallica albums, and the latter offers the perfect helping of rich saturation for bluesy solo lines. More utilitarian players — especially those who already have go-to pedals for distortion, overdrive, reverb, and delay effects — will probably be taking the hardest looks at the company’s new Level Set Buffer and The Bends Compressor. With the level set pedal, you’ll be able to swap guitars more easily without affecting the entire tone of your setup, and a mute switch allows for silent tuning. The black compressor pedal will help you tame volume spikes and extend the sustain of notes, bringing a fuller overall sound to your guitar tone. Throughout testing, we were thrilled with the build quality of the new Fender pedals, with buttery knobs, crisp switches, and virtually no audible pedal noise — the biggest enemy of guitar players seeking cool sounds. That’s not surprising, considering our history of great experiences with Fender gear. The new pedals range from $100 for the Level Set Buffer and Pugilist Distortion to $200 for the Santa Ana Overdrive, placing them above the cheapest options on the market, but well below more boutique options like those from Strymon and others. After playing with the Fender pedals for a few hours, we think that the great construction, signal-to-noise ratio, and vast tonal options on offer make the new line very compelling, and we recommend trying them out before you spend more money on a pedal that you might ultimately like less.